Last night we had our first videoconference. Test started at 7:30pm and meeting ended at… 1:30AM! (and just because there was a blackout on my street). * Weird names are AWESOME… but please, make sure to have an audio file with a proper pronunciation – Thank you. * ask about your friends life… they will be happy to share some details with you so you are not just a robot. * Focus on fulfill ideas, not only give them. * We need more marketing outside events… if we have 2.000.000 linux users on a country and we only spread fedora on an 200 people event.. we are waisting 1.800.000 potential contributors. * Don’t join the community expecting to get a job, join it because the fun and with fun, might come a work. * Are you a girl? or just a robot? * How is to be a community person for you? * What are your tasks on Free and Open source community? * Which is the best experience you can remember being a community leader? * Bring a key people of each team available to allow new contributors to get sponsorship and contribute without have to wait after-event. * show the simplicity of contribute to fedora with people examples. Hi! well, I have realized that people srsly need that human factor this days. Maybe is just me, but I trully believe that there is no code without hands. You mention in the title that you had 21 attendees. 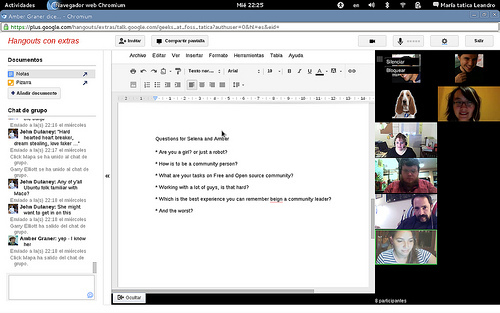 I thought Google+ Hangouts are limited to 10 people. How did you work around it? Or did people come and go during the hangout, with never more than 10 people at any one time? I really hate that Google is capping it at 10 attendees. Our team is ~12 people, so someone always gets left out (or we have to switch to something less cool). I *totally* agree. A video conference–specifically a Google+ Hangout–is a surprisingly human experience and has revolutionized the remote work experience. It’s funny how much the brain interprets those meetings as being in person. How often do you physically touch a co-worker anyway? Seeing them in their own element, face-to-face is as good as being there, without any of the drawbacks (commute, distractions, small cubicles). We also get to points (and agreements) a lot quicker than endless e-mail threads. And a few clicks and there they are, right in front of you.